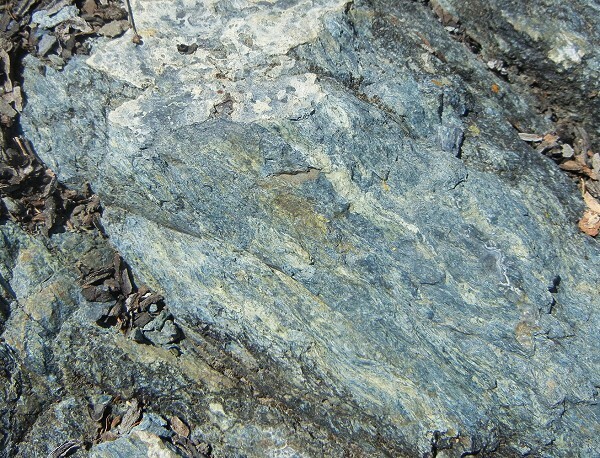 I will continue to focus on serpentine rockserpentinitefor a while longer because I’ve been visiting it a lot lately in Oakland. 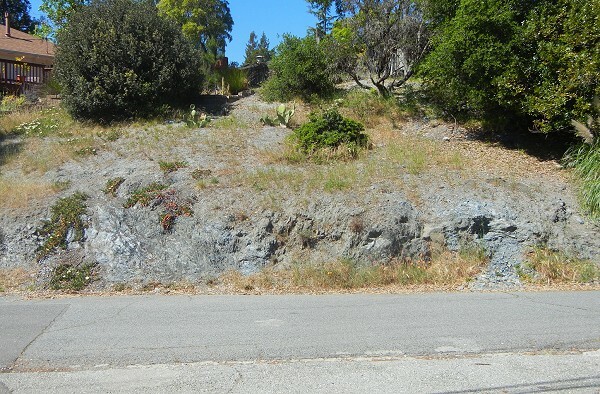 This post shows some exposures in the lobe of serpentinite mapped just south of Joaquin Miller Road. 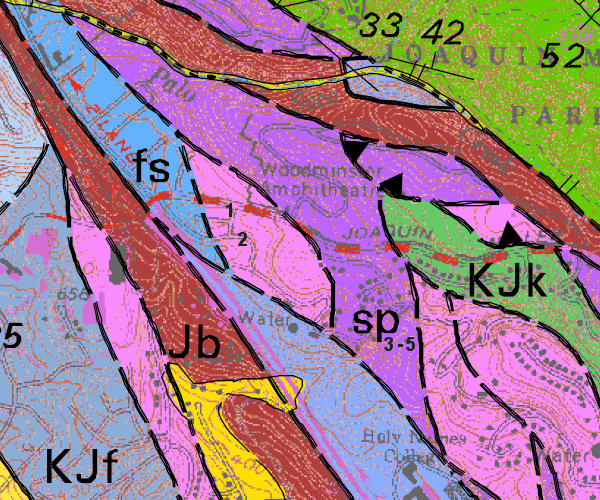 This bit of the geologic map shows where we are, and the five numbers are where I took the following photos. 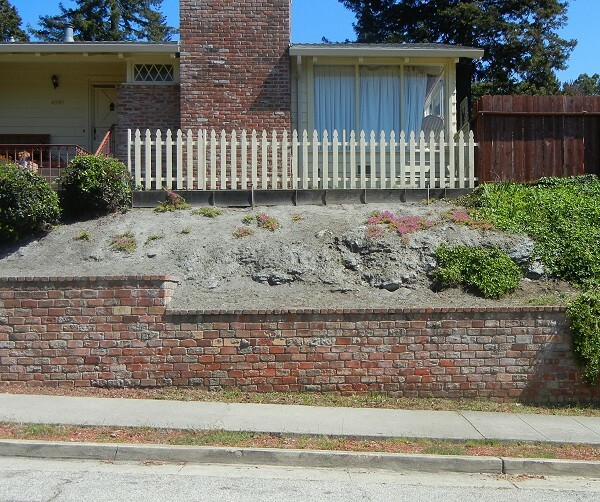 The first photo is at the head of Hedge Lane, right off Joaquin Miller. The map says this is a blob of Leona “rhyolite,” but the ground is clearly serpentine here, on the whole street. 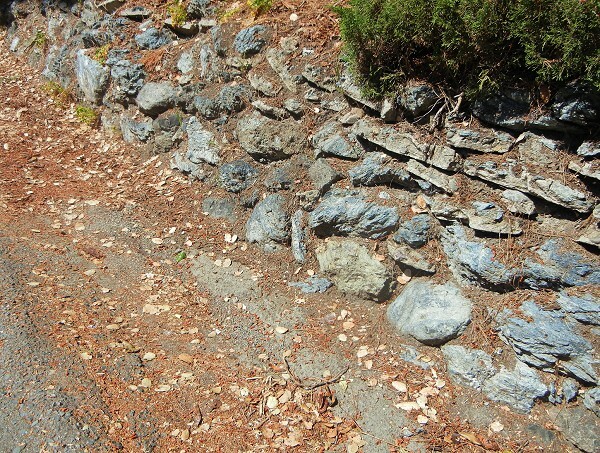 A little farther, on beautiful bucolic Burdeck Drive, is this serpentine stonework. 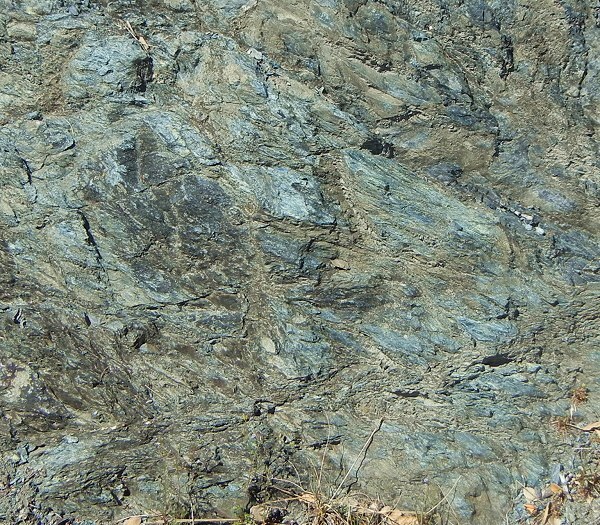 It doesn’t prove that there’s serpentine bedrock here, but it does suggest that some is lying around. So here we have a piece of the geologic map that’s mapped as one thing, but is clearly another. That’s the nature of geologic maps. They aren’t like street maps. They’re simplifications of a welter of vague clues in the landscape and bits of rock, surmises based on drilling records and engineering reports, and highly informed imagination. No doubt the mapper’s field notes mention “serp” where I saw it, but the area is still predominantly “rhyolite” so that’s the color it’s assigned. Along the rest of Burdeck, the ground looks like something other than serpentinite, although no bedrock is exposed: unlike serpentine ground, the soil is thick and the oaks are vigorous. Then we join Butters Drive, just to the right of the “sp” symbol, and serpentine returns in all its blue-green, scaly glory. Here are two closeups from this exposure, testimony of mighty squeezings deep underground. This entry was posted on 11 May 2015 at 8:02 am and is filed under Oakland serpentinite. You can follow any responses to this entry through the RSS 2.0 feed. You can skip to the end and leave a response. Pinging is currently not allowed.